Courage. The word swirls round my head today, a year after the horrific terror attacks on Westgate mall in Nairobi that left 67 dead and scores injured. Courage because so many individuals ran into the mall during the shootouts to try and save innocents. Courage because Acumen's board had planned a trip just a few days after the attacks; and while the Al Shabaab terrorists were still unaccounted for, our board showed up anyway. Courage because of the resilience we experienced throughout the city. Nairobi would not bow to terrorism. And we all became a little bit braver. 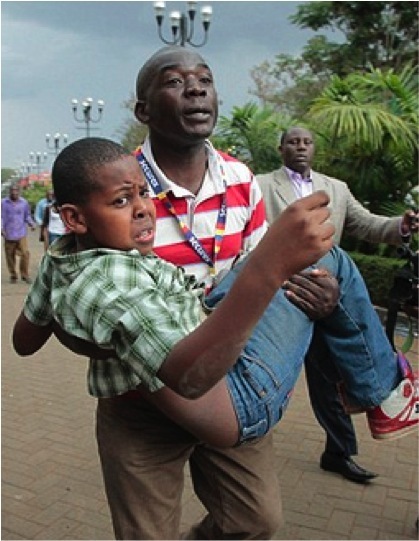 A year after Westgate: the world feels less safe, more fragile. Al Shabaab is active. Kenya has experienced terrible violence - grenades and shootings, kidnappings and worse. Elsewhere, the Islamic State has beheaded two journalists and an aid worker. Russia has annexed Crimea. Ebola has taken the lives of more than 2,600 across West Africa and the number of infections and deaths expected is rising. Everywhere, we see inequality, the potential for unrest. The one thing in short supply is the thing we need most: courage. We need courage to confront the immediate threat of terrorism and to address the long-term challenge of poverty. This will require the markets, government and civil society. It will demand that we understand the difference between means and ends. It will require steering clear of corruption, doing what is right, not what is easy and gaining a reputation for being trustworthy. It will require building cohorts of diverse young leaders and giving them the skills and tools to solve complex problems across lines of difference. That isn't easy. Easy is kowtowing to one's own constituency. Easy is agreeing to a plan publicly and then rejecting it privately. Easy is omitting to step forward and be counted when it is deeply uncomfortable. Easy is the opposite of courage. The good news is that all around the world we see examples of individuals and organizations working on behalf of a more inclusive world, making markets work for us, not control us. In honor of the Westgate attacks, let me focus on a few Kenyan examples. I think of Dr. Ernest Mureithi who runs Miliki Afya to build an affordable chain of health clinics across areas that have received too few quality resources. The company is a model for driving down healthcare costs and making every patient feel welcome. I think of Nat Robinson who runs Juhudi Kilimo, an agricultural financing company reaching low-income farmers. I think of the three founders of Sanergy, a sanitation company turning waste to revenues in the Nairobi slums, and providing jobs to more than 175 already. These entrepreneurs have dared to change broken systems. They walk with the courage to do what it takes to build trust, fight corruption, face betrayals and failures and still come back with the belief that things will get better. It isn't easy. Nothing of importance ever is. It requires quieting a trembling inside and doing what you have to do anyway. It requires a profound assumption of human goodness. It means sometimes feeling hammered, duped, exhausted and confused and still getting up to do what you have to do. It necessitates a resolve derived from understanding that all we really have is one another. Courage builds from every day decisions that ultimately dictate who you are. It grows out of those ideas and people and values for which you stand. It requires speaking truth when it is not spoken. It requires staying open to those from different ethnicities, religions, tribes and races across lines of class and nation and sexual orientation. It entails mastering empathy based not on pity but on a moral imagination embedded in the belief that our separation is not inevitable. As Kenya renews, let us remember those who were needlessly murdered as well as their loved ones. Let us give thanks to the individuals, official and unofficial, that did what they could do to help someone in need during the tragedy and in the months that followed. Let us, most of all, resolve to act with more courage, to speak truth, and ask ourselves whether our actions are bringing more opportunity, more freedom, more dignity to others. If we can answer Yes, then we will not have endured the devastation in vain.